I would like to take this opportunity to thank Binduu for the amazing spiritual sessions I have had with her at Cosmic Centre. She have such an amazing and vibrant energy that gave me alot of strength and courage to face my challenges. She were always honest with me and spoke from the heart. I had great comfort in our sessions and it just drew me closer to my spiritual side. I always left her sessions feeling positive and stronger. I feel like I have gained and formed a strong and great friendship with Binduu and the Cosmic Healing Centre and for this I am eternally grateful. I have no doubt that the Cosmic Healing Centre will grow from strength to strength and is blessed to have spiritual healers like Binduu. I am very successful in influencing a large audience; many people look upon me as a successful team leader. However I was not able to control my family members and my disrespect was increasing by each passing day. I approached the Centre and Ssrija, FengShui Consultant recommended me to change the vastu of my house. Now there is perfect harmony and we are a united family. I have had visited the Cosmic Healing Centre at a time when I felt that many obstacles where blocking me from attaining my potential. I have been working for a long time on some research work but have not been able to finish the work I was working on. I procrastinated a lot because of headaches, lack of concentration and enthusiasm. I also wanted to get married, but again many things where delaying the marriage and actual proposal. Our home did not feel alright, and we, as a family, suffered from lots of tensions and quarrels. I came to see SSRIJA, who was very kind and supportive, and she suggested a house clearing and after that some healing sessions for me. After the very first healing session for me I was able to finish off a major part of my research, a part that I have been putting aside for a couple of years! And after the second session (after clearing my blocked root chakra) I finally was free from my chronic constipation ( a side effect of a terribly congested root chakra, I discovered that later!). The person who proposed to me finally was able to make it our home for a formal proposal and actually said that he felt welcomed and relaxed at our home!! Things just happened so quickly, in perhaps two weeks, as if they were supposed to happen a long time ago, yet there where serious blockages that were delaying matters. I feel happy, at peace and light in my body, and many people commented on the way I look, and the sparkle they see in my face. I may have read about the power of the mind, yet, have not managed to experience any depth were I can really get a feel of it. I came to Abeer with absolutely no expectations and what really took me there is her sincerity in offering her services. I was bewildered with what she has offered. Abeer has such a soothing approach and a willingness to heal others. She gives you the pathway to find your own wounds and helps you heal them in a very loving way that barely hurts. She doesn’t give up on you and works with you with a strong will and a desire for a better tomorrow. While I was standing at a bus stop, I was hit by a car that had lost control after it had hit another car. My injuries included multiple lacerations, subcutaneous swelling on the right leg and foot, and a broken fibula. Going through the crutch, cane and limping stages in the course of five months, I gradually regained the ability to do basic physical leg movements, except full knee bends and squats. Sanai did pranic healing on my right leg and foot. Immediately after that, I was able to bend my knee to a full squat. My physical activities involving the affected leg are now back to normal. My Son 6yrs old was in Coma for eight months.. Doctors could nothing when he doesn’t have any internal blocks.. Thanks to Ssrija, thinks of her as an Angel of Allah.. She woke our Son from the Coma with no efforts. We are more connected with our Son now. She opened our eyes. Very Humble, she is. But SHE IS SIMPLY GREAT. Allah shows us signs and miracles in various ways and through different people who comes across our lives, Abeer you are one of those sings which God give to me, I was personally inspired by you Abeer, the way you share your help and support to friends is really touched my heart, and You have teach me that, If we share with care, light and love, we will create a abundance and Joy for each other, you have helped me a lot to understand more about the unconditional love and to calm down my anger and my ego. You have teach me how open my heart and allow myself to receive all love and happiness, Also I was personally healed by you Abeer; you have healed me from a very chronic constipation problem, wish I consider it as a miracle. With all my gratitude I would Thank you my dear friend and my dear guard angel, for your time and help, May Allah reward you for this noble job that you are doing to help people. May Allah bless you. I'd like to share my story. After many years of having lower abdominal pain, an ultrasound showed that I had six follicular cysts on the right ovary and three on the left. I also had a fibroid on the middle layer of the uterus. I started visiting Cosmic Healing Centre. Last year my doctor referred me to another ultrasound. This time my ovaries were clean. The huge fibroid has also disappeared. Thanks to Suzy because I feel so much better now. I first visited Cosmic Healing Center in the month March 2010. My left breast was giving me some pain. After completing a mammogram, the doctor told me that I have a cyst. I was frightened and decided to try treatments with Ssrija. After my full eight sessions with Ssrija, I received another exam. Surprisingly the doctor was congratulating me. My cyst was gone. My mother had suffered from severe "hot" pain in her feet that kept her awake for nights, and red colored patterns started appearing on the soles of her feet. We first went to a Dermatologist who diagnosed the "patterns" as Psoriasis and prescribed a strong cortisone ointment to be applied on her feet. However, the pains continued and the cortisone just aggravated the symptoms. We went to a Orthopedic and after many questions and numerous X-Rays he diagnosed my mother with borderline osteoporosis and put her on Calcuim supplements. Again, not much improvement. Finally, we thought that maybe we should see a Neurologist (the Dermatologist suggested that maybe we should see a Neurologist especially that my mom is a diabetic). The doctor said that these were nerve-related symptoms especially that my mom has been a diabetic for 9 years now. He prescribed B-Complex vitamins (which my mom already takes!) plus some epilepsy medication that is believed to cure nerve-related diseases! Of course my mom refused to take the last medication and decided to tell SSRIJA about her feet. SSRIJA told my mom to immediately stop all medication and that her pains are emotional in nature, rather than physical. After 6 healing sessions, my mom still had some pain, but SSRIJA comforted her telling her that her body was clean and that her pains will cease after two more days. And that is what happened! My mom's feet are very well now, she sleeps at night, and the "heat" has stopped. She can walk for hours without much pain, and if she experiences some soreness (due to long hours of shopping!) she simply soaks her feet in warm salty water, just as SSRIJA advised her, and all is fine! The red patches on her feet, which turned flaky and sore because of the cortisone, are nearly gone. SSRIJA has proved once again that she is a genuine healer. Thank you SSRIJA! My mother is a little past 80 years old. Last year she fell and broke her arm. The doctor said that she needed surgery, that her bones would not get a chance to grow back without one. He told us that her arm may never function. Most of the treatments Ssrija was performing were by using my mother's photograph. Now my mother's arm is perfectly fine. Thank you very much Srija for you kind heart and support. My 11 year old son had an ear infection for 3 months. We visited the doctor's office 7 times. He has prescribed antibiotics, but they did not help. We ran across Cosmic Healing Center by seeing the ad in a magazine. After six sessions of treatments his infection was gone. Thank you Ssrija for your wonderful gift. In the period of 31 years I received many different diagnosis; heart problems, bad circulation, veins and artery problems, thyroid issues, and blood cancer. I've known Srija for twelve months. Since I got to know her, I am once again able to live a normal life, my constipation went away, the pain in my breast which bothered me for 3 years has disappeared, and my leg cramps are gone. I believe in the power which God has given Ssrija. I feel it because after my sessions with her I want to fly. I am happy. Ssrija thank you for bringing light to people. After many attempts to find help with my health problems in medicine, I decided to come and see the Healer, to experience for myself what Pranic healing could do for me. On my first visit I was impressed by a beautiful person who projected compassion, kindness, and a positive energy field which I could not explain. It made me feel calm and relaxed. She named my physical problems right away by seeing the aura condition on my body. I then began to feel a strong, warm energy around my body from her hands at close distances. That feeling was a therapeutic energy that renewed and regenerated life's energies.I will continue to visit Cosmic Healing Center. It's a miracle. Thank you Ssrija, Healer from God. My mother is 72 years old. One and a half year ago, she was diagnosed with heart failure, and the doctors determined that she had 6 months left to live. Before this diagnosis, my mother was very energetic. However, after learning about her health problems, she became severely depressed. I had been visiting Ssrija that time, and decided to bring my mother to her for a session. Since then, a miracle has occurred; my mother is still alive. She is happy, humorous, and goes by herself to see Ssrija. Our family is forever grateful to god for making Ssrija a part of our lives. Divorce is one of those life events that forces huge changes in your life whether you like it or not. I am a strong woman, still the divorce made me alone in my own head every day with a range of emotions – anger, relief, humiliation, depression and fear. I was confused and overwhelmed at the same moment. I just went to Dubai for a change and graciously met this Healer, Ssrija. Words are not enough for the Happiness; I am going through after meeting her. Just two healing sessions, I had with her. All the said emotions are gone. I feel so happy, lighter, radiant and love. I am Confident and Positive. Thanks to Cosmic and Ssrija. Thanks to Allah, for that I know, He guided me to Cosmic. For a very long time, I was feeling depressed. Nothing brought me joy anymore and I couldn’t remember the last time I really was happy and content. My life seemed like it came to a standstill. I was not happy at work, I was lonely, and I did not know what my purpose in life was. I was just passing days. By sheer coincidence, a friend of mine told me about energy healing with Ssrija. I met her for a consultation where she pointed out some chakra blockages that were the cause of my spiritual and energy ailments. Over the course of 4 sessions, I witnessed an unbelievable transformation in my energy levels, my outlook on life, my thought patterns and even my physical appearance. I became a new person due to the pranic and theta healing Ssrija carried out for me. The light that I allowed into my being attracted more light from the outside world and I am experiencing bliss for possibly the very first time in my life. I later did the DNA Activation treatment and I am feeling waves of unconditional love and bliss to the extent that even my plants at home have been transformed, exhibiting more flowers blooming in a week, than in the past three years combined. I am positive it is because of my heightened positive energy levels affecting them. 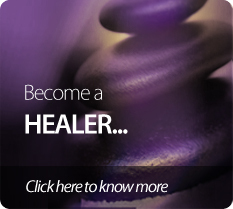 My treatments at Cosmic Healing Center have completely changed my life for the better. For all you skeptics, you have nothing to lose by trying; in fact you will only come out of the experience winners. If nothing, you will become more relaxed and positive. And for those who are already believers and more receptive than others; get ready for an experience of a lifetime. As for Ssrija, may God bless her. She was great throughout my experience and guided my healing process with such compassion and support. I am forever indebted to her. I was in a deep state of emotional turmoil with anger, frustration and irritation at myself, my life situation and my family. I knew I had to let go and forgive everyone and everything and myself to begin with, but dint know how. Shobhana gracefully taught me that, forgiveness does not mean to party with the person you are angry with, but let the hook off my energetic field. I burst out releasing so much and was longing for some affection. She sat down with me, hugging me, rubbing my back with so much compassion, and that night changed my life. The next morning was a new beginning. I had gone for forgiveness meditation by Shobana with less expectations. I knew I had a lot of anger and hurt within me that I wanted to get rid off. I didn't realize that it would help me to such an extent. This meditation truly cleared all the old baggage and left me feeling light and wonderful. I think everyone should do it at least once!